Posted by Derek Hughes on 31st October 2018. As it is nearly Halloween night! We have mixed a spooky cocktail to have at any great party! It will certainly fit in with the Halloween theme. This old classic cocktail, was invented by it’s owner Philip Guichet. The drink supposedly originated at Tujaague’s, a bar in the French Quarter of New Orleans, Louisiana. USA. The cocktail drink tastes like a chocolate milk shake and normally served as an after dinner drink! 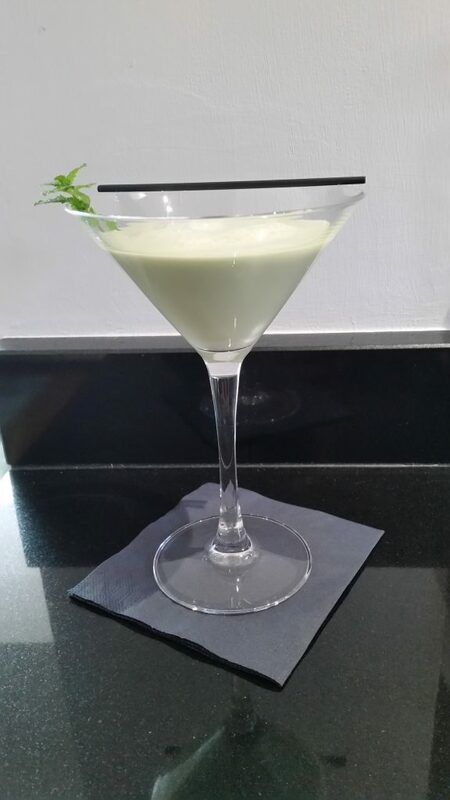 The name of the drink derives from one of the key ingredients called crème de menthe. To start you will need to ‘pre-chill’ the Margarita glass, by filling it up with ice! This is so by the time you have mixed the cocktail and are ready to pour it, the glass is cold enough. Pour equal measures (25ml) of the Crème de Menthe and the Crème de Cacao into the bottom of the cocktail shaker, with (about a third of the way up, inside the cocktail shaker), the pre-mixed milk and cream. Before, shaking the cocktail, place a few ice cubes in the cocktail shaker, then shake the cocktail by mixing it roughly 10/15 times over your shoulder. Throw away the ice in the Margarita glass and strain the cocktail, as you pour it from the shaker into the glass. Ensuring no ice goes into the glass. Finally, garnish with a sprig of mint. Relax and enjoy!